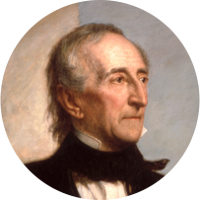 President Tyler was a firm believer in manifest destiny and spent his final years as president working towards the annexation of the independent Republic of Texas which was successfully completed by his successor President Polk. However after the start of the Civil War, former President Tyler sided with the Confederacy and was elected to the Confederate House of Representatives shortly before his death. President Tyler's family tree is not as well researched as some of his fellow presidents, but he does have some early Virginia roots via the Armistead family. He has a number of famous cousins through his 4th great-grandparents William and Ann (Ellis) Armistead. These include General Robert E. Lee, polar explorer Admiral Richard Byrd, Declaration of Independence signer Thomas Nelson, and both Presidents William Henry Harrison and Benjamin Harrison. Ironically it was President William Henry Harrison that Tyler succeeded after the death of Harrison. Letitia (Christian) Tyler, wife and First Lady of President Tyler, died of a stroke in the White House in 1842. Shortly after his wife's death, he began seeing Julia Gardiner, a woman almost 30 years his junior. In February 1844, Julia Gardiner, her sister Margaret, her father David Gardiner, and 400 other guests were invited on a presidential cruise aboard the newly launched frigate U.S.S. Princeton. On board was the world's largest naval gun nicknamed “The Peacemaker.” The gun was ceremonially fired several times during the cruise. During one of these firings, the gun malfunctioned and exploded killing a number of guests including Julia's father David Gardiner. Despite this tragedy, Julia Gardiner became the First Lady of the United States after she married President Tyler in 1844, just four months after her father's death.